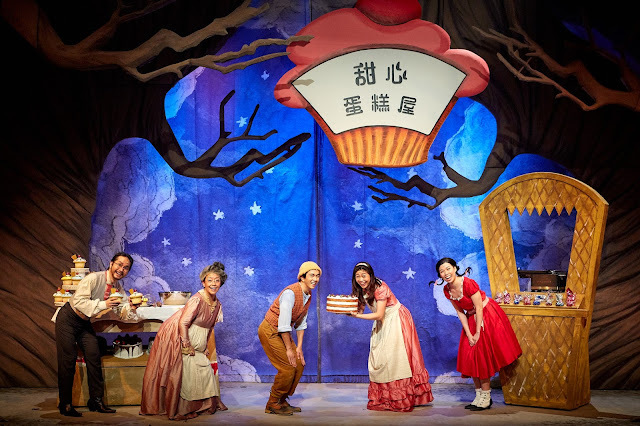 After successfully staging it in English, SRT’s The Little Company now presents Red Riding Hood in Mandarin. Red Riding Hood is an uplifting story about a brave girl named Red. It is an adapted story out of the traditional with clever twists and surprises. The scene began with a lively and happy family until Red's Dad went mysteriously missing one day. With much search, wait and anticipation, there was simply no news or sight of her Dad. Without the master baker, her Dad, the family's bakery shop was at stake of closing down. Red must journey through the forest to reunite her family and save Mother's bakery from closing down. The adventure was one that kept us, audience on the edge of our seats. There were various close to danger encounters Red had with the charming Big Bad Wolf, which also taught us not to trust a person by his looks. Then there was the appearance of a very forgetful woodcutter and a misty fruit tree that was so inviting, but comes with a cost for eating it. Within reveals yet another interesting story of the wolf, which later becomes wolves. Mysterious eh. The unexpected and leading story plot is one that is hard to guess and keeps the audience in suspension of its ending. It is however, like any fairy tale, a happy ending. Yay! Not bursting the bubble with too much details. The scene between Red and woodcutter was filled with more songs and dialogues, which may be a little slow moving for younger kids, but it was also filled with extreme humour that sent the kids to stitches. Always a wonderful thing to know the kids understand and are following through. Red Riding Hood in Mandarin is one play that kids should not miss. How will the journey be hindered or deterred by the Big Bad Wolf? Will Red reach Grandma's house in time? Or will the charming Big Bad Wolf distract her from her quest? 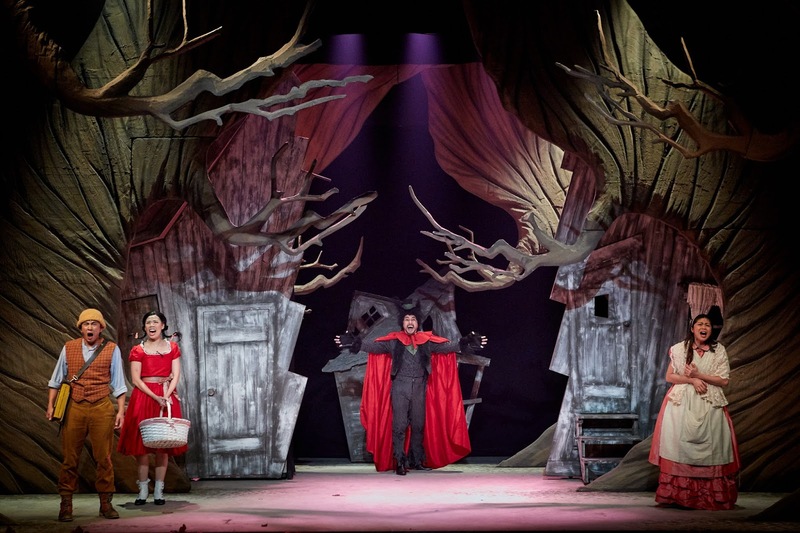 It is one that invites you to join Red on her adventure into the woods, where no one is what they seem! SRT's plays are always filled with quality props, scenes, scripts, casts, original songs, singing and even their renovated lobby is so great looking! 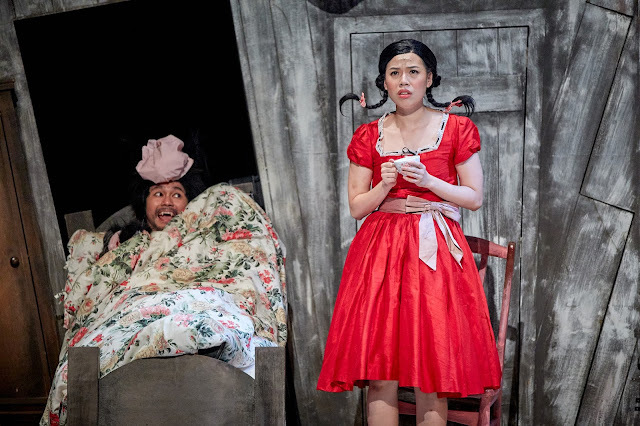 We especially love Chinese plays by them as it is not often that we come by quality Chinese plays. A perfect exposure for kids in our culture of English speaking society. Excellent play! Only looking forward to more 成语 used in future Chinese plays. This play is about 60 minutes and perfect for children 5 year old and above. Get your tickets today! I've been a Mum for 8 exciting years and still counting on... the kids are now 8, 6 and 1 year old. I've journeyed from a working Mum to a stay home Mum and now, a work from home Mum with a humble start up that was very much motivated by wanting to get some pocket money of my own. Which through it all, I realised the worth is better to be employed at a fixed salary. Thoughts have evolved, I'm struggling with the decision of being home full time. Along the years, the older kids have grown to be less needy of me. I have since cultivated an inner desire of wanting to re-enter workforce. Rising cost of raising families! But each time I think of the routine I'm leaving behind in order to get a job, I withdraw the thoughts. There are just so many departments I've to seek cover for! Which are often better tasked by self handling. I'm their Mummy taxi, chef, tutor, helper and many other roles that won't be competently covered even if I have a live-in helper. With the many portfolios to handle, I've to confess, it's a challenge to keep sanity at bay. I see through almost every nitty-gritty of kids and home, which means I get to frequently witness and handle their nastiest fight, craziest mess, laziest moment and merciless tantrums. Mum gets them all. Some days, it's a struggle. Leaping from 2 to 3 kids was such a bold decision that I often wonder, why did I ever get myself into such handful state?!! I'm glad the thought did vanish each time I look into the adorable face of our latest addition. I must have done something pleasing to God, to have been gifted 3 wonderful children! Thankful for the calling to Mother these kids. So how do I make my days work?! Little things count. 1. Get kids involve in household chores. I realised my bad of not instilling home responsibilities after I saw how overly pampered the eldest was at certain circumstances. Not cleaning up after herself or not putting toys away. The oversight we often miss when it comes to first child parenting. Responsibilities can be mimic, and habits have to be cultured as young as possible. If the older sibling is doing it right, the younger will follow. We do not have a helper and it is a good ground for breeding home responsibilities. I get the kids to help themselves in whatever duties they are capable of, by trying to put things at a level they can reach for, or with the help of a stool. I get them to do little chores by putting clothes in the washer, setting up for meals and washing their dishes after meals. 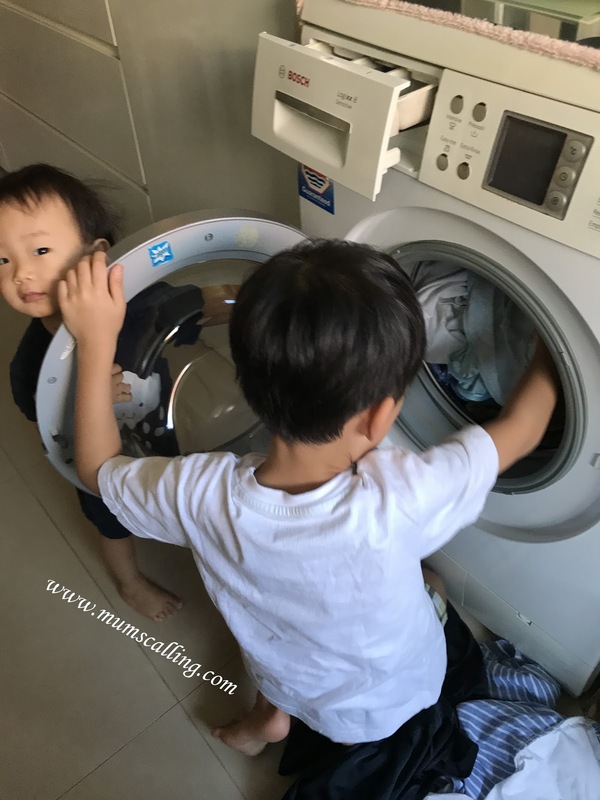 It helps vastly at lightening my load, containing my nags and lifts up the good spirit of a proud Mama moment each time they complete a task on their own. I don't get much help when it comes to handling kids. My parents are as busy as bees. To get help, I need advance arrangement. I have recently sounded to my Mum, asking her for a weekly morning time off where she can help with the littlest. With such arrangement, I can either keep the time solo for non-child activities or to catch up with friends. Having a boy and girl is vastly different. Boys need that big room for movements and expulsion of energy. While a girl seems able to find anything indoor to occupy her time. It helps that Jare goes to a school that has an outdoor space for play. I only hope they adhere to their outdoor timetable daily. 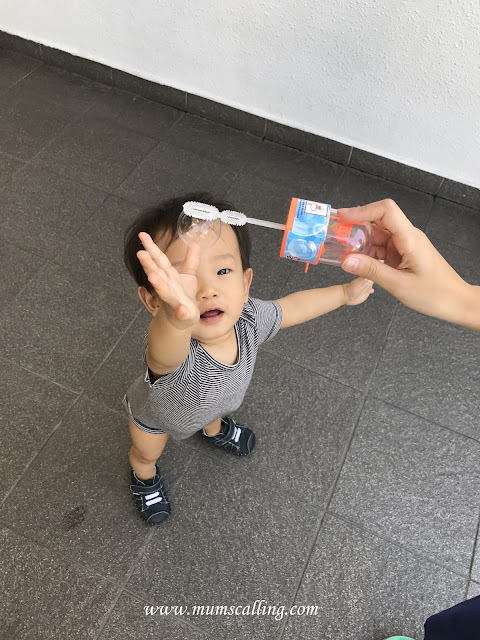 Even for the littlest boy, I had try to find time everyday for bubbles or water play, or even if it means a stroll outdoor. The after outdoor time can be rewarding, they fuss less. Very often we may fall into the trap of disciplining in anger rather than love. Which can lead to disastrous and sometimes, regretful outcome. I can be very hot headed when the kids drive me up to the wall. Before I can find time to rationalize a little, I snap. So yeap, a corner that I can go to and breathe in and out is useful at times. Here's what I've done up at my time-out corner years ago, and still in use. When Jazz started primary 1, it was also the year I started my days at 6 am. Which I realised it was a perfect timing for me to prepare and work on anything that fits the time before the boys are up. I could be in the kitchen marinating my meat for dinner, doing the laundry or blogging. Mornings are perfect, before the kids awake. Late night options don't quite work for me on some days. I'm exhausted flat after a day of Motherly duties. It doesn't help that age is catching up. We all have got a phone with an audio recording function. Some evenings when I need to portion myself among the kids for various purposes like bedtime stories, or revising 听写 and spelling, I would pre-record them into my phone and play it for whoever needs it. Usually, the littlest gets to own Mummy, while the older siblings are more understanding to contend with my audio voice. So each time you read a bedtime story, record it! It will be useful on nights you can't avail. Our kids love to read. I get really quiet moments when our reading corner is filled with new library books. They would usually devour books after books till called up for meals. If there is a certain activity that keeps the kids occupied, it will be good to have it stocked and handy. What do you do to big boxes after buying new appliances? I keep them! 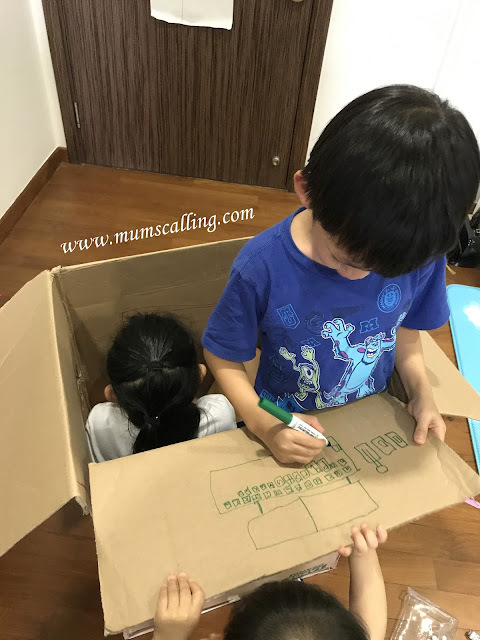 Throw the kids into the box with markers, and they will start doodling away! It buys me some time. Do you get this coming from your kids? "I have nothing to do!" I get it on some days and it kind of frustrates me! Firstly, it's alright to be bored (though I don't quite like being bored), and secondly, are those toys sitting around not of any entertainment value? 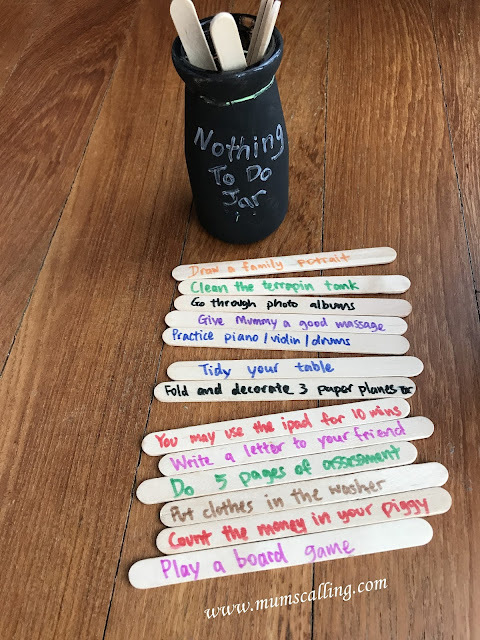 I came up with a 'Nothing to do Jar' where they can pick out a 'lottery stick' with a suggested activity that they have to adhere to. Strictly adhering to their choice even if it means doing assignments. 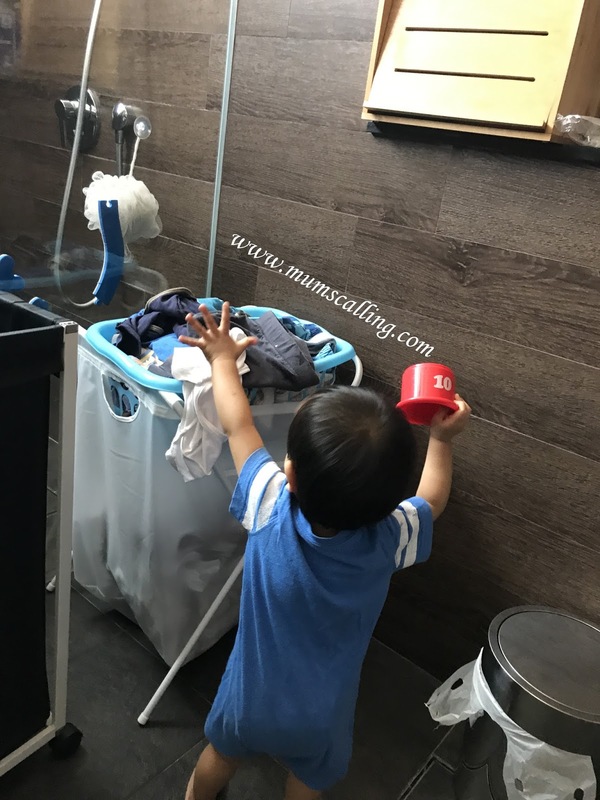 Being a stay home Mum keeps me so busy with chores and meals that I think it can be tough to savour quality time at some moments. While juggling with routines, there is also a struggle of guilt when the kids received a big part of my fatigued soul. It is only fair that they play with a refreshed Mummy. It's tough I know, how often can we smile and happily welcome a draggy long game of Monopoly? Well, as we create wonderful childhood memories for our kids, we are reminding ourselves that it's hard to recapture time lost while they are young. Enjoy every little moment. Motherhood is a calling, I live on God's guidance and intercede for the kids whenever I'm lost. 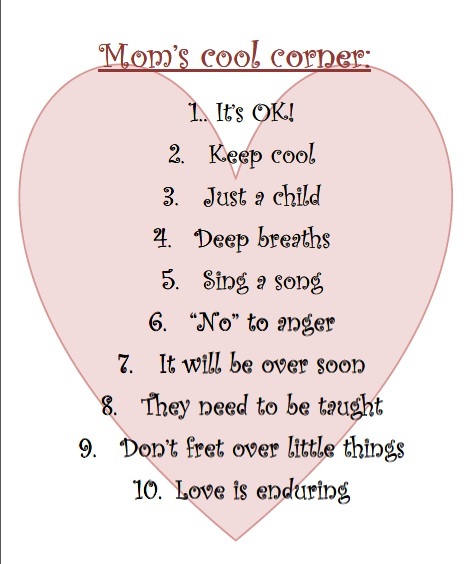 It is essential for Mums to stay positive and happy. It sets the dynamics and atmosphere of the home, don't you think so? Find time for yourself and do what works for you and your family! This post is part of the ‘Mothers Make It Work!’ Blog Train hosted by Owls Well. To read other inspiring stories please click on the picture below. If you would like to travel to the previous stops on this Blog Train and read more interesting stories about how Mothers make it work, you can start with this one here, how mummies make it work by Elisa over at Give them roots and wings. 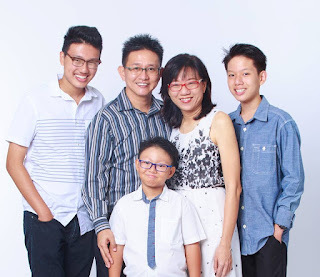 Elisa is a part-time working mum to three boys - two teen and one tween. She works with Kindergarten children. She is learning every day, to enjoy her older children the way she enjoyed the as little ones. At next week's stop we will be visiting Angie Yeow from GrowingHearts123. Angie is an educator at heart and by profession. 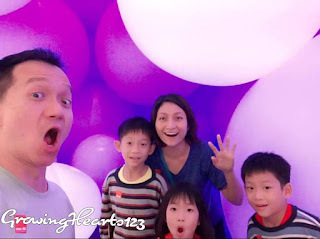 She blogs on her home education activities and is passionate about the visual arts. For this blog train, a special insight from husband and wife (Angie's) honest views on: How she grew in slowly becoming a support to hubs! She also shares how she handles the kids when she was a Stay At Home Mum and now as a working mum. It's the phase 2B week. We have successfully registered our number two, Jare into the school system for P1 next year. It was a phase I never thought we will fall into. It was option (a) for us. We did a calculated risk and checked with the school we eyed before deciding that 40 hours will be a contained risk for us. While some schools require beyond 40 hours of volunteer service, as if parents should devote their days to being a full time school volunteer or keep their fingers constantly on alert to responding the call of hours fulfillment. It's ridiculous when friends tell me it's 80 hours or even endless hours for some extremely popular schools. That's insane! 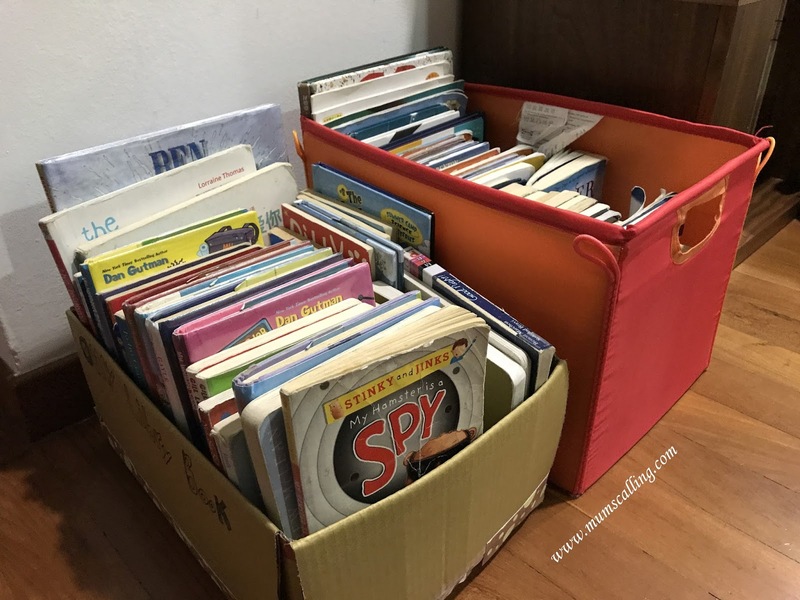 Once upon a time, when my kids were still far away from primary registration, I sneered and was much sure I will not join the race of being a parent volunteer, in hope of getting to a popular school. Such path should be eliminated, I thought. I spoke too early, the day came! Plan A of putting all kids in the same school didn't work out, plan B was getting Jazz into my alma mater which is a girl's school. So great! I've 2 boys. These hassle were all in them name of, "I don't think all school are good schools." We had a weird decision (to some) of going through such admission exercise twice, when it could be just an easy phase 1 for most. About 18 months ago, the man and I embarked on a volunteering journey in our potential school. We took students on excursion, we did games and activities in school, we did library duties and whatever duties that would help us clock 40 hours. Happy we are, but honestly, there is greater joy in serving when your child is already in the school. You feel the connection and relationship. It was a great way though, to be more sure of your choice when you step in to witness the school's culture. 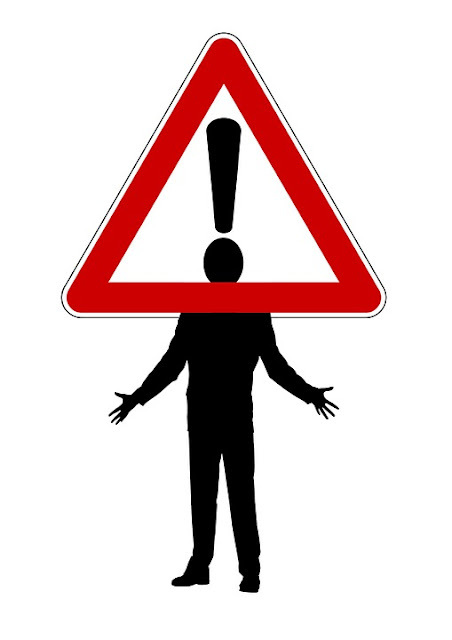 Not easy are these volunteers serving with an uncertain outcome. In the name of being kiasu, I do know of some volunteers who served 2 potential schools or did parent volunteer as back up for more school options. It can be a painful outcome to have spent hours and hours of time for a potential school and end up with no placement. While some families are extreme risk takers, we like ours calculated. If there are a few options on the school you eyed, run a detailed check on the volunteers intake and number of hours required. It helps much in managing expectations. If not, start being involved as a community leader early. It has more school options than just volunteering in a particular school. I think this phase is beaming bright for us, and it's looking prominent with no likelihood of ballot. 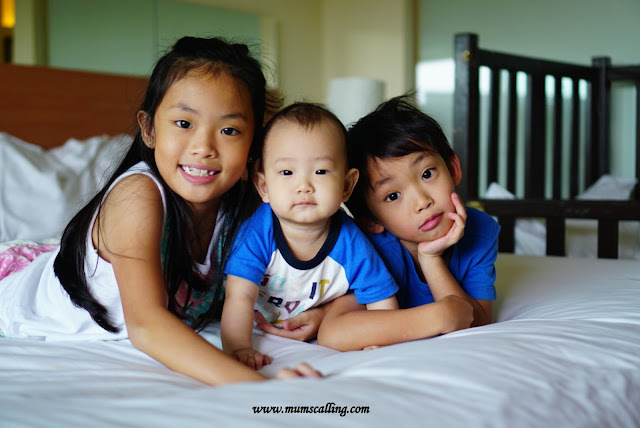 As a Mum, it is beyond a phase of registration but the swelling of mixed emotions that my kids are growing too quickly. It's true when we say we should treasure every moment of their growing up. There are two things that I can't keep my hands off - dogs and babies! They are too adorable to not touch and love. Before kids came into the picture, I bought a pup. It was always a top 'must have' list, once I have a place of my own. It wasn't too long after I got married that I got a pup. Even though it of much disagreement with the man, I went ahead to buy and rear one. I must say, it was the best decision ever. I had the best dog ever and it saw me through the addition of my kids! Decision in owning a dog is always easier before babies come into the picture. Both time and commitment can be given easily. Do however think twice about getting a dog if you have very young toddlers in the family. Do you get an often question from your kids about buying a pet? Or more specifically, a pet dog. It is a decision not to be taken lightly. Are you expecting or had a newborn recently? Or is it near the months of your child's big exam? It is definitely not a wise decision to get a pup at the same time you expect to receive your newborn or when your child is nearing a major exam. It can be really exciting and distracting to have a new live in pup. A new pup requires much training in the initial months when brought, especially toilet training. It can also be extremely barkish and chewish. Like babies with sprouting teeth, they have the tendency to chew on toys and sometimes, furniture. It can be excessively annoying at times. Plan on when is a good time to get one. 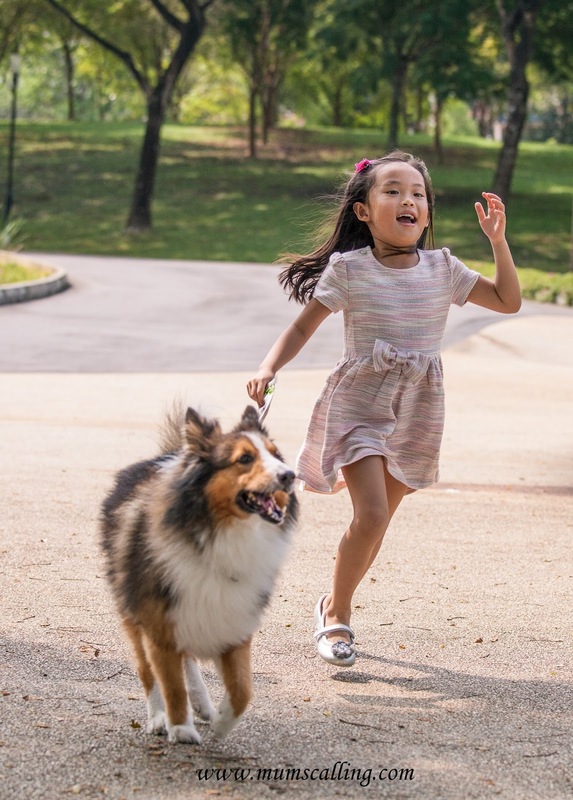 Older kids are more likely to be responsible in helping with the pet routine. Some days, I sent Jazz out to walk the dog within our neighbourhood. Okay, I watched her from a distance to witness her maturity. Teach the kid to clean up after their dog's business. Younger kids are more likely to fit the 'play' department. Access the maturity and responsibility of your child. Studying the breed and character of each dog helps a great deal. Some breeds are extremely child friendly and mild nature. While some are just not as tolerant with strangers and kids. 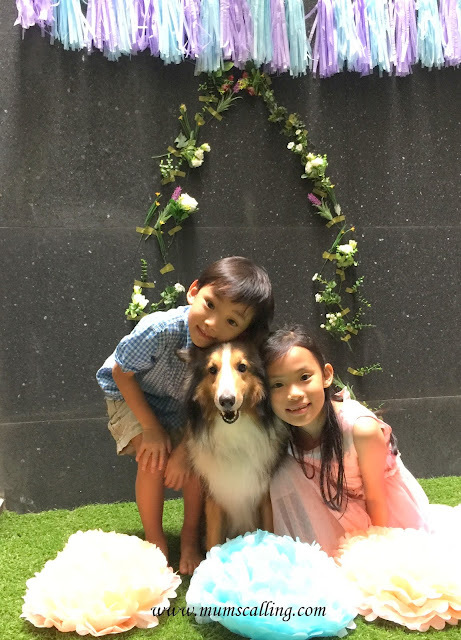 We owned a Shetland Sheepdog and I've to say, it was the most patient dog ever! It survived and stayed calm through every 'rough handling' of our children. 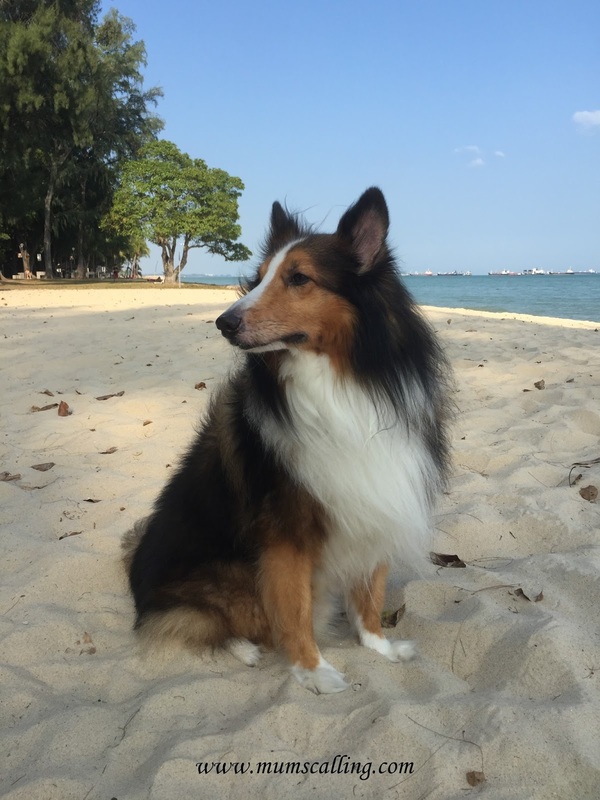 When his tail and paws were accidentally stepped on, he would silently get up and walk off. Even dogs know the best way in dealing with conflicts! And of course, other considerations include your housing type. Some breeds may shed their fur excessively too. Do bear in mind that bigger dogs may pounce forcefully or exert much energy on younger kids. Food, vaccinations, license fees, toys, treats, grooming and boarding costs too, if travelling is in your schedule. It is not just about providing a shelter. 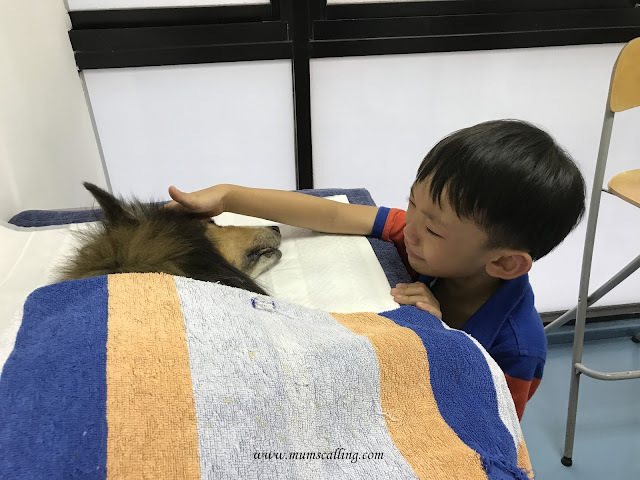 In the final few days of our dog's life, medical bill was steep. And no, can't use CPF. Heh! The big indicator. It takes a few days of almost full time attention to integrate a pup to home. I remember I got our pup on Saturday morning, just so I can have weekend and the next few days of leaves to help it adjust. Life gets a little better after tiding through its toilet training and teething days. The daily commitment includes walking, feeding and basic healthcare. Brushing long fur dogs daily can help cope with shedding. Bathing may be done weekly. Pups are extremely barkish and active. They may startle a sleeping baby or even become your daily alarm clock. I really have not much of a solution to 'silencing' dogs, but some dogs can be trained upon the command of 'Shut.' Well, not all. It's best to keep the dog as comfortable as it can be to avoid excessive barking. We are at our neighbour's mercy. So yes, patience in command training. Toilet training requires the bigger part of your patience. Dogs are territory markers, especially in a new environment. They mark by their pee, and most times they tend to go for corners. Hang in there and keep training! Rearing a pet requires a mega consent from all parties living in the same household. While it can bring much joy to your family, it can also cause much disputes if there's disagreement. I know, I insisted on one even though my man wasn't agreeable. I was somehow confident he will love it, and he did! Have a deep thought and assessment to getting a pup. We had a great and memorable time with our pet dog, Pillow. He was so fluffy and cuddly that the man named him that. He was everyone's best friend, especially Jazz. Jazz is an extreme pet lover and I've to say, Pillow inspired her greatly in wanting to be a Veterinarian. A costly education abroad, we know. While there are these many considerations to having a pet dog, I've to say bringing a dog home was a decision I never regret. My kids love it, they grew up with it and they sleep and cuddle him like a Pillow. It lived up to its name. On days when Jazz was upset, she would 'confide' in Pillow and her mood got brightened up instantly. A true indication that, there is no better friend than a dog. A dog is a wonderful pet. Too wonderful to not be purchased on impulse or simply because the kids want it. A dog's life span can live up to 15 years, it is a long term consideration! It is not a pet to be purchased with the intention of caging it up 24/7. It is not one bought for our helper to take care. It is our responsibility to see through the companionship we chose, and for that, it can be incredibly rewarding. It's so easy to fall in love with a cute pup, but owning one is not a decision to be taken lightly. Taking too, this opportunity to Thank the dedicated Vets at Companion Animal Surgery. In their day of a busy clinic, they gave us so much time and space to farewell Pillow before his time was up for Euthanasia. Dr. Eleanor was very assuring and comforting. It was a busy day for her, and putting a dog to sleep is probably her frequent task, but she made it all so assuring and accepting for us. Dedication is what I define her. "Thankful for the companionship of 9 years and 5 months, Pillow. You gave us so much joy!